Wall hanging section provides all sorts of accessories for indoor and outdoor display. From the stained glass, paneled glass to vintage wooden decoupage, carved, or handcrafted plaques, pictures, and displays allow you to browse through the variety of choices. Antique and vintage candle holders, sconces, light fixtures worth of displaying or incorporating in your current design style. Framed oil paintings, airline posters, Native American art, drawings and various media paintings would add the elegant element to any room decor. Japanese vitnage plates in vivid floral design. Vintage needlework Cape Disappointment display. Hoop Dancer pencil drawing print by Bob Dale. Johnnie Walker Red decoupage mirror advertising from 1970. Vintage The Epic of Flight Aircrafts poster from Time-Life books. O. Coleman print of New Orleans, The LA Branch Building, framed and ready for display. O. Coleman print Wall hanging, four corners LA. O. L. Coleman print Wall hanging, Rue Orleans LA, framed. O. L. Coleman print Wall hanging, In the shadow of the Cathedral LA, framed. Vintage Islamic Temple metal Etching in color, Middle Eastern art. Vintage large Cotton American Flag with 50 stars. Rooster wall hanging reproduction by A. Churchill. ROUTE 66 acrylic glass mosaic design hanging decor. Terry Harrison pencil sign print Caught And Bowled Cricket game observers in elegant wooden frame. Terry Harrison pencil sign print The Angler's Retreat in an ornate wooden frame. Fly Fishing theme wooden decorative display in 3D appearance. Italian ornate heavy metal wall candle sconce for 3 candles. Vintage Coca Cola advertising Mirror in wooden frame decoupage design. Vintage framed metal work art with floral bouquet of lilies imprint. Large handmade Needlework floral bouquet framed vintage art. Landscape Oil Painting in wooden frame, vintage art. 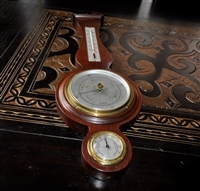 Solid Mahogany Barometer by Fee & Stemwedel Inc, Chicago, 21" long. Vintage Nylint Corporation Financing, Leasing, Insurance The Associates Metal toy Truck Trailer. English Watneys Traditional Beer Mirror advertising wall decor. E. Birk large oil on canvas original painting by Danish artist, needs restoration. Oil painting, landscape around the lake by G.Jumper 1986. 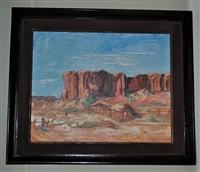 Oil painting on canvas by F. Starr Fink 1963. 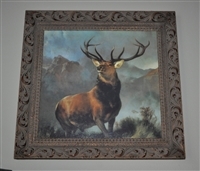 Landseer Monarch of the Glen oil painting. Oil painting, vintage painting with lake side landscape, '86. United Airlines Washington D.C. poster 1973. United AirLines Washington D.C. poster 1967.